Windhoek - Namibian president Hage Geingob wants to form a presidential council with his predecessors as members, he said on Monday. 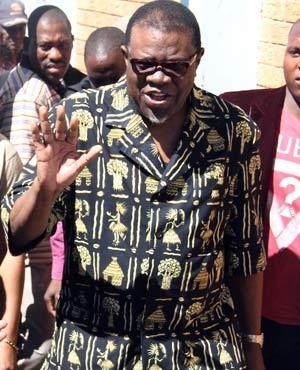 "Once I assume executive state authority, I will establish by executive decision, a presidential council which will be composed of the sitting president and the two former presidents who have garnered valuable experience over the years," Geingob told reporters. He said this was linked to the concept of what he called "New Africa", a Sapa correspondent reported. "In the past, former African presidents would either be exiled, imprisoned or six feet under the ground. "In the New Africa, former presidents live freely and in tranquillity in their countries, enjoying respect and appreciation from their countrymen and women. They often end up playing important roles in their countries," Geingob said. Liberation struggle icon Sam Nujoma ruled Namibia for 15 years from independence in 1990 to 2005. He was officially bestowed the title "Founding Father of the Namibian Nation". Nujoma's successor, Hifikepunye Pohamba will hand over power after ten years in office to Geingob next month, on the country's 25th Independence Day, 21 March. According to Geingob, the presidential council would co-opt former prime ministers, deputy prime ministers and "other key personalities that have formed the backbone of Namibian politics since Independence, if need be". "This process will be important for camaraderie, consultation and continuity of government policy," Geingob said. He further made known the names of eight members of Parliament he will appoint when he assumes office. Among them are three current cabinet ministers, who did not make it to Parliament on the internal Swapo party list of candidates for last year's national elections. The three are Home Affairs Minister and former secretary general of the ruling Swapo party Pendukeni Iivula-Ithana; Youth, Culture and Sports Minister Jerry Ekandjo; and Presidential Affairs Minister Albert Kawana, who also serves as the country's attorney general. Both Ekandjo and Iivula-Ithana unsuccessfully contested against Geingob for the position of Swapo vice-president at the party congress in 2012. Former deputy speaker of Parliament, retired Bishop Zephania Kameeta is another Geingob appointee. The other four MPs are Katrina Harmse-Himarwa, governor of Namibia's Hardap Region; Bernard Shidute Haufiku, a medical doctor; Obed Kandjoze, managing director of the Namibia Petroleum Corporation (NamCor); and Heather Sibungo, a female school teacher and a member of the Swapo Youth League. His choices were determined by "ethnical diversity" and balanced representation from Namibia's 14 regions, Geingob said. According to the recent constitutional amendments, Namibia will for the first time in the country's history have a vice-president, who will be appointed by the incoming president.